Place a 2mm Goldhead Bead at the eye of the hook shank, secure the bead with a piece of copper wire bent into a loop and tied down the hookshank with thread. Build up a slight body with the thread, which allows a tight fit for the 3 additional fluo red beads. Then cast off the thread. Add varnish to the thread and assemble the three fluo red beads onto the varnished hook shank, making sure they are tight and secure. Restart the tying thread at the base of the 3rd fluo red bead. 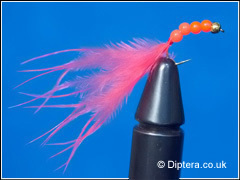 Pick out a small bunch of red marabou, Catch the marabou in with the thread at the base of the 3rd fluo bead. Cut off excess Marabou and create a taper with the thread so that the 3rd red fluo bead is secure, then cast off the thread. Varnish the tapered thread between the 3rd fluo bead and the marabou tail.